Mayo 0-16 Leitrim 0-7 (James Stephens Park, Ballina, 2/2/1964). MAYO: J McGuinness; W Casey, V Nally, M O’Malley; E Walsh, C Hanley, E Melvin; J Langan (0-2), J Morley; J Farragher (0-4), M Connaughton (0-1), M Fitzpatrick (0-1); M Ruane (0-1), JJ Gibbons (0-2), P Sheridan (0-5). Cavan 1-7 Mayo 0-4 (Breffni Park, 9/2/1964). MAYO: J Foye; W Casey, V Nally, M O’Malley; E Walsh, C Hanley, E Melvin; J Langan (0-1), J Morley; J Farragher (0-1), M Connaughton, M Fitzpatrick; M Ruane, JJ Gibbons, P Sheridan (0-2). Subs: T O’Boyle for Ruane, P Gibbons for O’Malley. Mayo 1-13 Meath 2-7 (MacHale Park, 8/3/1964). MAYO: J Foye; W Casey, V Nally, P Gibbons; E Walsh, C Hanley, E Melvin; J Langan (0-4), J Morley; J Farragher (0-1), M Connaughton (0-1), P Bruen (0-2); M Ruane (0-1), P Dolan (0-2), P Sheridan (1-2). Sub: PJ Loftus for Dolan. SEMI-FINAL: Mayo 3-9 Roscommon 1-7 (MacHale Park, 5/7/1964). MAYO: J Foye; W Casey, V Nally, B Reape; E Walsh, M Wallace, E Melvin; PJ Loftus, J Morley (0-1, a ‘50’); J Langan, J Farragher (0-1), M Connaughton (1-2); F McDonald (0-4), M Ruane (1-1), D Doris (1-0). FINAL: Galway 2-12 Mayo 1-5 (Tuam Stadium, 19/7/1964). MAYO: J McGuinness; W Casey, V Nally, B Reape; E Walsh, M Wallace, P Griffin; PJ Loftus, J Morley; J Langan (0-1), J Farragher (0-1), M Connaughton; F McDonald (1-2), M Ruane, D Doris (0-1). Mayo 1-9 Sligo 1-6 (Fr O’Hara Park, Charlestown, 18/10/1964). 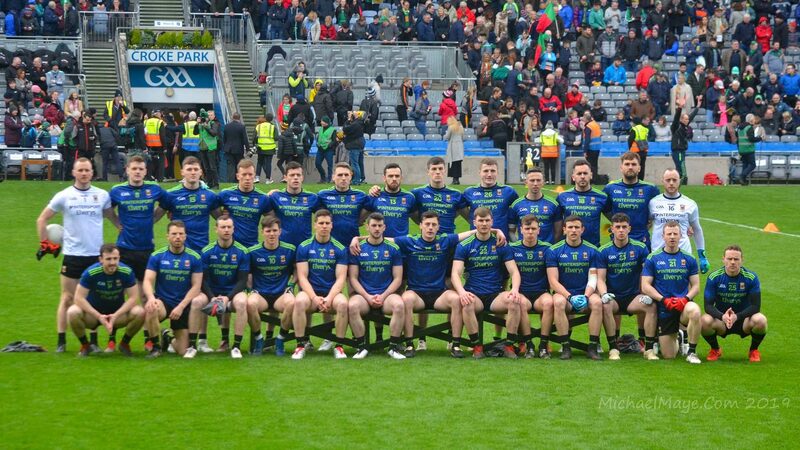 MAYO: J McGuinness; E Walsh, M O’Malley, J Fleming; P Griffin, M Clarke, M O’Sullivan; M Connaughton, PJ Loftus; J Hennigan, D Doris (1-1), J Langan (0-7); M Ruane, P Dolan, J Farragher (0-1). Westmeath 3-6 Mayo 3-8 (Cusack Park, Mullingar, 1/11/1964). MAYO: J McGuinness; M Clarke, M O’Malley, V Nally; P Griffin, E Walsh, M O’Sullivan; PJ Loftus, M Connaughton; J Farragher, D Doris (1-1), J Langan (1-7); M Ruane, P Dolan (1-0), P Creighton. Mayo 1-14 Longford 0-5 (Ballinrobe, 8/11/1964). MAYO: MAYO: J McGuinness; M Clarke, M O’Malley, V Nally; P Griffin, E Walsh, M O’Sullivan; PJ Loftus, M Connaughton (0-2); J Farragher (1-4), D Doris (0-2), J Langan (0-2); M Ruane (0-1), E Maguire (0-1), P Creighton (0-2). The Under 21 grade was introduced in 1964 so this means that the team listed below for the match against Leitrim on 6th August that year was the first to play an Under 21 championship match for the county. SEMI-FINAL: Mayo 1-4 Leitrim 0-7 (Fr O’Hara Park, Charlestown, 6/8/1964). MAYO: V Wehrley; M O’Malley, B Groake, V Nally; P Corrigan, B Reape, C Hanley; M Connaughton (1-3, three frees), M Healy; J Cleary, M Hannon, W Fitzpatrick; J Nealon, R O’Loughlin (0-1), P Monaghan. Subs: JJ Cribben for Monaghan, M O’Sullivan for Hanley. SEMI-FINAL (REPLAY): Leitrim 1-4 Mayo 1-14 (Pairc Sean Mac Diarmada, Carrick-on-Shannon, 13/8/1964). MAYO: V Wehrley; B Groake, V Nally, C Hanley; P Corrigan, B Reape, V Keane; M O’Malley, C Dolan; W Fitzpatrick, M Connaughton (1-3), M Healy; R O’Loughlin (0-1), T Staunton (0-9, eight frees), J Nealon (0-1). Subs: M Hannon for Healy, M O’Sullivan for Corrigan. FINAL: Galway 3-6 Mayo 3-5 (Tuam Stadium, 16/8/1964). MAYO: V Wehrley; B Groake, V Nally, C Hanley; M O’Sullivan, V Keane, S O’Connor; M O’Malley, C Dolan; M Connaughton (2-1), F McDonald (0-2), W Fitzpatrick; R O’Loughlin (1-1), T Staunton, J Nealon. Subs: V Hughes for Groarke, T Kitching (0-1) for Staunton. Leitrim 2-7 Mayo 2-14 (Pairc Sean Mac Diarmada, Carrick-on-Shannon, 12/7/1964). MAYO: JJ Costello; M Shannon, C Loftus, M McNicholas; M Flatley, P Heavey, J Earley; J Gibbons (0-2), A Kelly; J Ryan, P Kilbane (0-4), J Moran (1-1); S Gallagher (0-1), JJ Cribben (1-5), M Lally. Subs: S Smith (0-1) for Flatley, F Mulchrone for Gallagher. Galway 1-3 Mayo 2-7 (Tuam Stadium, 19/7/1964). MAYO: JJ Costello; PJ Golden, C Loftus, M McNicholas; J Ryan, M Shannon, J Earley; J Gibbons (0-2), A Kelly (0-1); S Smith (0-2), P Kilbane, J Moran (1-1); J Coughlan, JJ Cribben (1-0), M Lally (0-1). SEMI-FINAL: Offaly 1-10 Mayo 1-8 (Croke Park, 9/8/1964). MAYO: JJ Costello; PJ Golden, C Loftus, M McNicholas; J Ryan, M Shannon, J Earley; J Gibbons (0-3), A Kelly; P Kilbane, S Smith (1-0), J Moran (0-1); J Coughlan, JJ Cribben (0-2), S O’Dowd (0-2). Subs: M Flatley for Golden, M Lally for Coughlan, S Gallagher for Lally.